"Obituary - William Morris Gosnell"
Birth date: Tuesday - April 06, 1830. Birth location: Glassy Mountain, section of Upper Greenville County, South Carolina. Married: Elizabeth "Betty" Ramsey on February 12, 1857, in Madison County, North Carolina. Matilda Chandler on May 26, 1869, in Madison County, North Carolina. Death date: Monday - January 29, 1906. Death location: Madison County, North Carolina. Burial location: Union Valley Cemetery, Madison County, North Carolina. Name of newspaper publication: News Record and Sentinel. Newspaper location: Madison County, North Carolina. Interested in family names from 175 years ago in Madison County? An obituary submitted by News-Record & Sentinel reader James Richard Gosnell of Spartanburg, North Carolina contains plenty of names, including that of deceased, Morris Gosnell. James Richard is a 5th generation descendant of Wiley Gosnell, younger brother of Morris Gosnell. 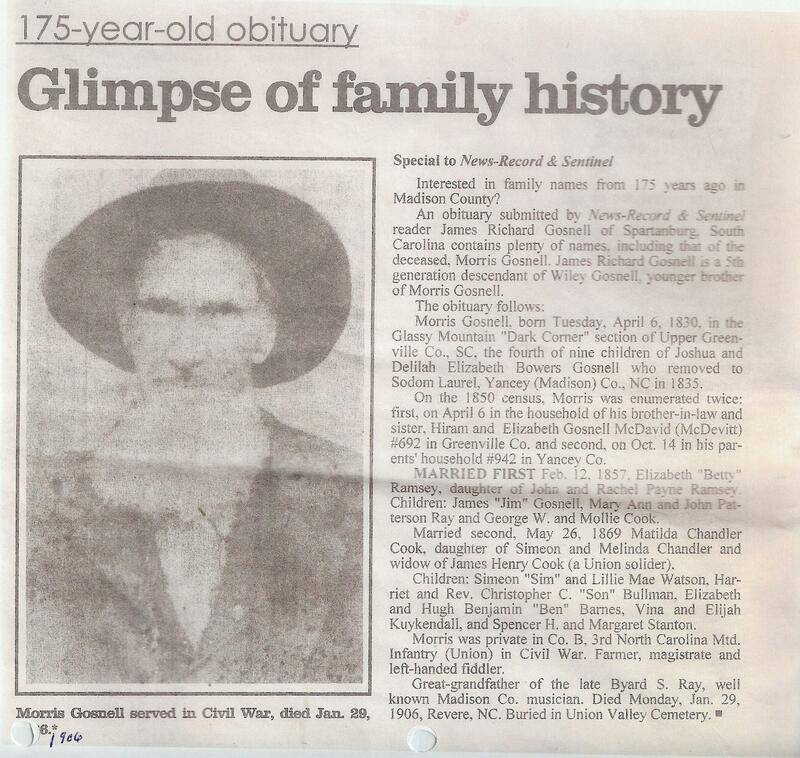 Morris Gosnell, born Tuesday, April 6, 1830, in the Glassy Mountain "Dark Corner" section of Upper Greenville County, SC, the fourth of nine children of Joshua and Delilah Elizabeth Bowers Gosnell who removed to Sodom Laurel, Yancey, (Madison) Co., NC in 1835. On the 1850 census, Morris was enumerated twice; first, on April 6 in the household of his brother-in-law and sister, Hiram and Elizabeth Gosnell McDavid (McDevitt) #692 in Greenville Co. and second, on Oct. 14 in his parents' household #942 in Yancey Co.
MARRIED FIRST Feb 12, 1875, Elizabeth "Betty" Ramsey, daughter of John and Rachel Payne Ramsey. Children: James "Jim" Gosnell, Mary Ann and John Patterson Ray and George W. and Mollie Cook. Married second, May 26, 1896 Matilda Chandler Cook, daughter of Simeon and Melinda Chandler and widow of James Henry Cook (a Union solider). Children: Simeon "Sim" and Lillie Mae Watson, Harriet and Rev. Christopher C. "Son" Bullman, Elizabeth and Hugh Benjamin "Ben" Barnes. Vina and Elijah Kuykendall, and Spencer H. and Margaret Stanton. Morris was private in Co. B, 3rd North Carolina Mtd, Infantry (Union) in Civil War. Farmer, magistrate and left-handed fiddler. Great-grandfather of the late Byard S. Ray, well known Madison Co. musician. Died Monday, Jan. 29, 1906, Revere, NC. Buried in Union Valley Cemetery.